Open your home to your kid and a few of their friends to spend the night on October 8. Make sure your kid has access to a smart phone and an Instagram account (they can use yours.) Also make sure you are following element_efamilies on Instagram so you can receive the dares. If you would like a preview of the dares (they are all appropriate, safe and just weird fun) then email Christie at marangi@ourelement.org and I’ll send you a list. Starting at 7 pm our staff will send out one dare every 15 minutes with a special hash tag in the comments. Your kid and their friends must complete the dare between 7-9:30 and either video or take a pic of the result, depending on the dare being attempted. There will be 8 dares total. Kids will then upload the vid or pic to Instagram with the appropriate hash tag. 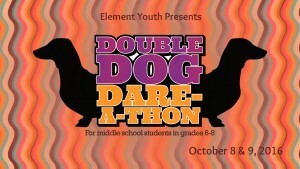 Our staff will be judging the completed dares on things like completeness, creativity, dedication and humor. STUDENTS DO NOT HAVE TO COMPLETE EACH DARE IN THE 15 MINUTE TIME FRAME! THEY HAVE FROM 7-930 TO COMPLETE ALL 8 DARES! The whole gang then comes to church on Sunday morning to the 11:00 service where we will have a special breakfast, awards ceremony and games to wrap up the event. That’s it! Pretty easy huh? The worst part will be cleaning up after those kids…but you should have them do that!